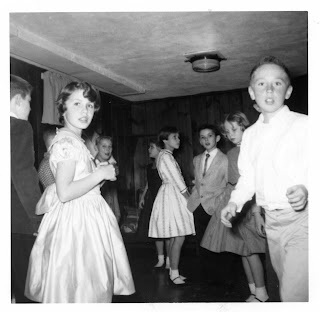 LESLIE'S KHS65 BLOG: 6th GRADE 1959 PARTY REVISITED - WHAT FUN! 6th GRADE 1959 PARTY REVISITED - WHAT FUN! In looking for something in my email files just now, I came across this photo which I don't think I have posted before: Left to right Bunny Wells, John Guyer, Patti Corpening (facing left) Anne Saxon who moved away, Roy Lamkin who looks just like this today, Julie Sands and I think I recognize the face of the boy on right, but can't make a name come to mind...do you know? Photo courtesy Mike Caldwell at whose home on McLain this 6th grade (Robinson) party took place. Thanks so much Mike for sharing!! !